Sean Colfer watched the reigning UK Mixed champions Black Eagles match up against the strong Canadian team Banana Cutters. Black Eagles and Banana Cutters entered this match with identical records – three wins and one loss, to Philadelphia AMP, meaning that this was for second place in the pool. The prize awaiting the winner was a round-of-32 match against IKU from Tokyo, while the loser would face Sydney’s Friskee. It’s safe to say that Cardiff will be a tournament most people won’t forget. Whilst Saturday was challenging, it was no more difficult than the conditions we experienced in Nottingham or Cheltenham for Mixed Tours 2 & 3 respectively last year. However, Sunday delivered some of the most difficult weather that we have had to play in for a number of years with wind, rain and mud in plentiful supply. Despite the conditions the games got under way in earnest. Pool-play threw up few surprises with both GB teams topping their respective groups. The GB U23 teams also impressed, improving on seeding and giving themselves a chance to move up the order next tour. Ireland Mixed comfortably topped Pool C after a convincing victory over Thundering Herd 1. Pool D provided the most interesting results with Shiny Happy Meeple comfortably topping the group ahead of both Black Eagles and Brighton Breezy, with returning players helping to show that they are one of the strongest contenders at Tour this season. 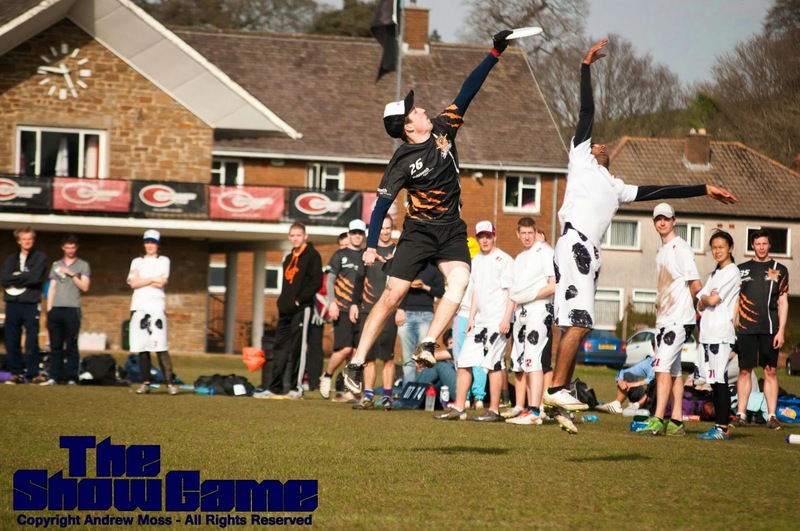 Matthew ‘Smatt’ Hodgson and Matt Dathan start off our Mixed Division WUCC 2014 previews with late additions Black Eagles. Black Eagles at UKU Nationals 2013. Photo courtesy of Graham Bailey. It may be the last year that Black Eagles have to compete alongside English teams to qualify for World’s if Scots vote for independence in September, and this year they got in by the skin of their teeth. Rewind four weeks and Black Eagles’ players were planning a summer free of ultimate, but thanks to a late drop-out, the team accepted a late entry to fly to Lecco. They narrowly missed out on a qualification spot last year, after an impressive start to the season in mixed tour where they fell just short. They will be missing two of their star players from previous year – Frances Dathan and Adrienne Tecza – who were both poached by Cambridge after Eagles failed to qualify. Despite limited preparation , Black Eagles will be travelling to Lecco with largely the same roster that finished mixed tour this season with an overall fifth-placed finish, third in 2013. They have only mustered one training session since being offered the spot a month ago, but that is one more session than they have managed together all season, so opposing teams would be wise not to underestimate the Eagles. As with Bear Cavalry, the core players of the squad have been playing together since their university days. But the club itself was only formed in 2011 and has African football to thank for its formation. explains James Glover, the lightning quick Yorkshireman who moved to Edinburgh for university and has stayed ever since. James was one of the three founders – along with Gordon Kerr and Graeme McDowell and explains Black Eagles as “unlike most other ultimate teams”. Scottish ultimate has long been known for tight defense and the ability to play in all weather conditions and, although the weather in Lecco looks set to be a little hotter than the typical Scottish climate, tough man defence and player familiarity should outweigh a lot of the missed preparation time. They like to deploy a no-nonsense, straightforward approach to ultimate, perhaps wise given their lack of preparation. “Our playing style is based on big shots – on the field and in the bar – and big takes,” he says. The Eagles have hovered towards the top of mixed tour for a number of years now, despite not holding organized training sessions and have been able to compete with and beat England’s elite, even if they have struggled to do it consistently over a whole season. At a time when Scottish open and women’s clubs have taken a step back from the golden age – when Ro-Sham-Bo were the most feared name in university ultimate and Fusion were regularly making open tour semis and finals – Black Eagles have become the best performing club in any division from Scotland. And they are not just representing Scotland. As the only team going to World’s who are a team based further north than the Midlands (Chevron divide their trainings between Bristol and Manchester) it shows how dominated UK ultimate is by southern, mostly London-based teams and how hard it is for players who are based in the north to reach the top echelons of the game. It would be refreshing to see a resurgence in northern ultimate and the opportunity presented by this tournament to gain elite experience is going to be invaluable. With little expectation, the team will be competing against the world’s best teams with nothing to lose. Although it will be frustrating competing at World’s lacking a full strength squad and not having had a full season of preparation, it is a fantastic opportunity for Eagles to gain invaluable experience in what could be their last international tournament representing Great Britain. The goal Black Eagles have set themselves is a top half finish and to “have fun while doing it”. Their motto – “go big or go home” – will be applied both on the pitch by day and off the pitch by night as they hit the bars lining the shores of Lake Como. Good luck to our only Scottish team at WUCC, more Smatt and Matt to come!